Here are some fun Christmas Activities for the Whole Family that don’t involve a lot of effort but bring a lot of fun and joy to the season. Are you looking for a few holiday activities that your entire family can enjoy? 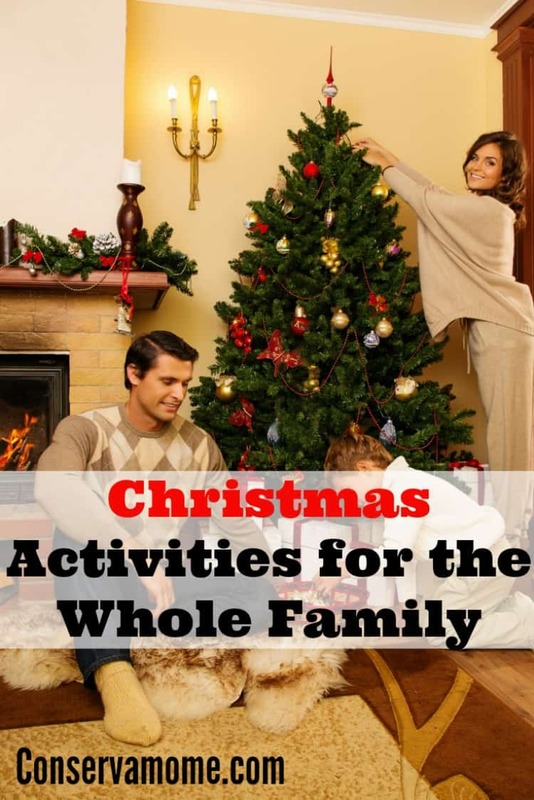 This list of five Christmas activities for the whole family will get you started as you make yuletide memories to cherish forever. Everything on this list if totally adaptable to families with kids of all ages so gather your entire brood and set off on an adventure. Load into the minivan and take a tour around your town to check out everyone’s holiday displays. This is a great activity for families with children of all ages. Make it a weekly tradition starting after Thanksgiving and look for new displays each week. You don’t even have to have a solid map planned out of where you’re going, just follow the colorful lights and blown up reindeer. Call ahead and find out a good time to visit. Invite along other families you’re close to if you want. Have your children draw pictures, make cards, or bake goodies to take along as gifts and you’re ready to go. Elderly people in nursing homes love visitors, especially children. As you visit with the residents you can distribute the homemade goodies and crafts you brought with you or sing Christmas carols. Most nursing homes have pianos in common rooms so if you have any budding pianist they can give a concert too. Pre-make the dough the day before and have it chilling in the refrigerator or go for easy and let Mr. Pilsbury help you. Make sure you have tons of decorating supplies and cookie cutters and have at it. Even the youngest family members will enjoy adding sprinkles and squeezing icing onto cookies and, of course, everybody will enjoy eating the fruits of your labor. If you’ve got a musical crew rehearse the verses of your favorite Christmas songs as a family then bundle up and venture out into the neighborhood to spread Christmas cheer. You can go simple and sing short tunes or go big and learn harmonies or dance moves to go with the songs Have fun with it, and don’t forget to smile! Great ideas! Christmas 🎄 is all about spending time together as a family!!! Great ideas!! I love light riding and we’ve been doing it since I was a kid!! We have some really awesome roads in this town that do it up right!! Super fun! !